One of the reasons I chose to review the Whirlpool Whispure was the well-known manufacturer’s name. Whirlpool is famous for designing great home appliances so I wanted to find out how well of a job it did with air purifiers. The second reason was the 3-stage air purification. I also liked the electronic controls, the sleep mode, and the declared ultra-quiet operation. The unit has a high CADR rating so it seems like a good buy for large areas, such as big living rooms and basements. The price is moderate which is often a deciding factor for many customers. So let’s take a look. While the manufacturer states that there is a 3-stage filtration system, there are actually only two real filtration stages. The 3rd one is the grill that seems to capture only the largest dirt particles and doesn’t do much for anything else. However, it still needs to be cleaned in soapy water on a regular basis since the dust and lint tend to settle there. Activated Carbon Filter – The unit is equipped with a simple activated carbon filter, which does a good job capturing odors and gasses and also some chemicals. 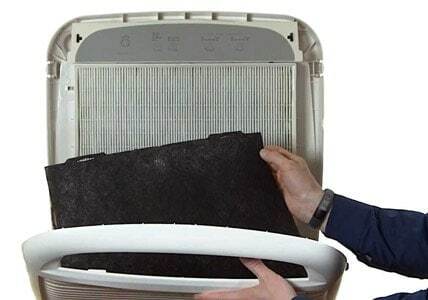 The carbon filter needs to be replaced every 3 – 4 months depending on the way you use the purifier. It’s not expensive. A four-pack will cost you about $30 which is a year’s supply. 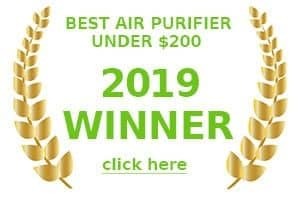 You can find deals on the yearly supply of both filters for this air purifier from about $100. The set includes 4 carbon filters and True HEPA filters. There is nothing complicated or advanced about the filtration system on the Whirlpool AP51030K . It’s more or less a standard set of two filters, one of which takes care of odors, the other one gets rid of small particles. Overall, I would recommend this filtration system to people with mild allergies but wouldn’t recommend it to heavy smokers or people with compromised immune system. After going through many different customer reviews, I found that filtration-wise, this air purifier does a good job if used in the recommended space and maintained the right way. There are no “wow” responses. But the job seems to be well done. I wouldn’t expect anything less from Whirlpool or anything more from a model which costs under $300. The design of the Whirlpool Whispure is quite simple and perhaps a little dated…which might be a disadvantage to the people who like modern and sleek-looking devices. It’s not too large. The dimensions are 12.3’’ x 22.1’’ x 27.2’’ and the weight is about 22 pounds. The unit is equipped with a built-in handle which makes it easy to carry around the house. It comes in white and black colors. The design of this air purifier allows you to put it against the wall. However, one of the downsides is that it heats up quite a lot when working. At the highest setting, the whispure 510 uses about 115-118 watts of energy which is higher than most air purifiers I reviewed. This results in a high heat output. If you were planning to use it in a smaller room, this can even become a problem in warmer climates…on the other hand this could be an advantage to people who live in colder areas. Some customers even describe it as a “portable heater”. The AP51030Ks is equipped with a nice control panel with easy-to-push buttons. You can choose the fan speed, the night mode, and check out the filter life indicators. I really liked the child-friendly option that allows you to lock out the control panel. Accordingly, you can safely place the unit into a a child’s bedroom. Overall, I’m satisfied with the design of this model. I like the simplicity. The filters are easily accessed which means the filter replacement is not a hassle. The manufacturer claims that this air purifier is designed to clean a room of about 500 square meters. After checking the CADR rating which is 315, I can easily say that the manufacturer is absolutely right. In fact, I appreciate the honesty here since most of the manufacturers tend to claim that their units clean larger areas than they actually can. When cleaning a 500 sq. meter room, the air will be run through the air purifier about 5 times per hour which is a great rate for keeping the room clean. If you use the unit in a large room, the air will be run through the filters slower which will yield slightly poorer results, however, I think most people will consider this satisfactory. Especially, if there are no special conditions, such as heavy smoke or excessive dust, you may want to consider a different air purifier for dust if you have particularly bad allergies since the HEPA filter is not as large as some. The manufacturer claims this unit to be extra quiet. It has 4 different fan speeds. The lowest speed is ultra-quiet and can be used in a bedroom. However, when set at the lowest speed, the air purifier is not doing a very good job of cleaning the air. So normally, I would recommend using at least the second speed for your bedroom…unfortunately, the light sleepers out there won’t appreciate the second speed since it’s noticeable louder than the lowest one. Whirlpool claim that at the highest setting, the unit produces a noise of 55 dB. This sounds impressive since it’s comparable to the sound of a quiet conversation. In reality, the highest setting is rather loud. It might even interfere with watching TV. So I would say that at the highest setting, this air purifier produces the noise similar to a loud conversation. 1st, 2nd and 3rd speeds are more or less quiet. I believe they can easily be used when you are watching TV or working. They won’t interfere with normal activities during the daytime. Unfortunately, this unit is not equipped with an air quality sensor which is a useful feature for all air purifiers but at this price, you don’t tend to find many that have. I would recommend running this unit for 12 hours at the highest setting after bringing it into the room for the first time in order to get rid of all the harmful particles and then switch to the second setting and leave it there. 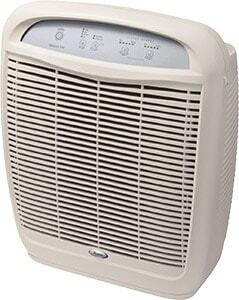 Running the air purifier around the clock is not necessary under normal conditions. 10 – 12 hours a day is usually enough. However, these 10 -12 hours should be spent at the second setting (at least) since the lowest fan speed is not too effective. The unit is equipped with a filter life indicator. I really liked the way it’s designed. Instead of just showing a red light when the filter must be changed, there is a scale. You can observe how the filter status changes over time. Which means you can be prepared for the filter change in advance and even get an idea of how efficiently your unit is working. 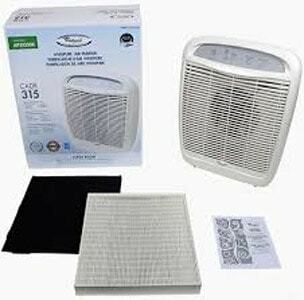 There is a separate indicator for the HEPA filter and the activated carbon filter. The unit has a sleep mode that turns down the fan speed and dims the lights. This is a great advantage for light sleepers. While the Whirlpool company has an excellent reputation, I still paid special attention to the warranty of the unit. I was glad to find out that they offer a long warranty of 5 years. However, I still decided to take a closer look at the conditions. In reality, Whirlpool offers only a 1-year warranty. If the unit is maintained in accordance with the instructions and the filters are replaced on time, the manufacturer will repair or replace the unit. You will need to provide a proof of purchase and a warranty book. After the first year has passed, the manufacturer offers only a motor warranty. It will repair or replace the fan motor if it fails under normal operating conditions within 5 years from the date of purchase. Also, the warranty is only valid if the unit is used in the United States and Canada. So when you read about the 5-year limited warranty on this unit, you need to remember that it’s really limited. After reading through numerous reviews, checking out the specs, and speaking to the owners, I came to the conclusion that the Whirlpool Whispure AP51030K is a great air purifier. I’m ready to recommend this model to people who are looking for a moderately-priced unit with all the features of an efficient air purifier. However, this is not a perfect choice for people who are faced with out of the ordinary air quality such as heavy smoke or intense odors. There are more advanced air purifiers out there that can deal with these problems better. The Whirlpool Whispure 510 AP51030K air purifer offers superb value for money. Not the cheapest air cleaner in town, but for the room size it can handle, it’s one of the best value out there. Styling is a bit dated now though. Better alternatives out there.